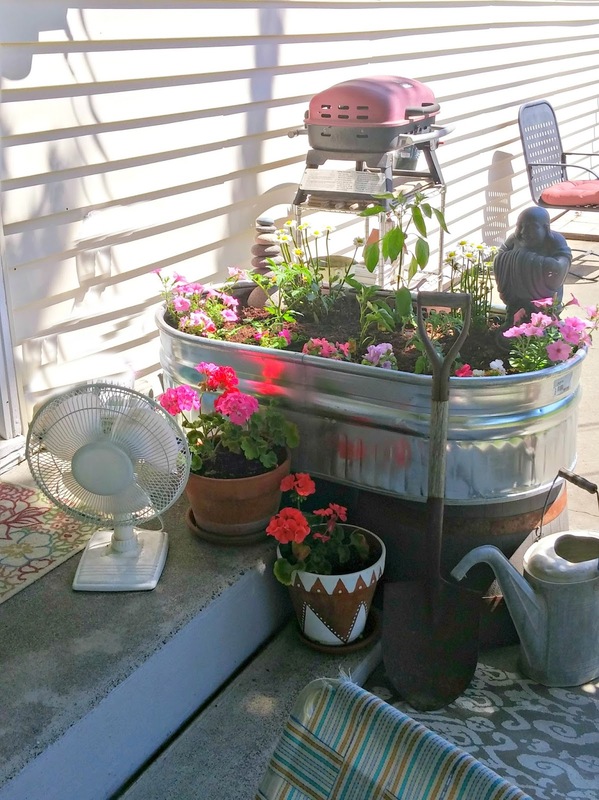 I am so ready for summer... grilling, gardening, enjoying the sunshine... that's my kind of living! 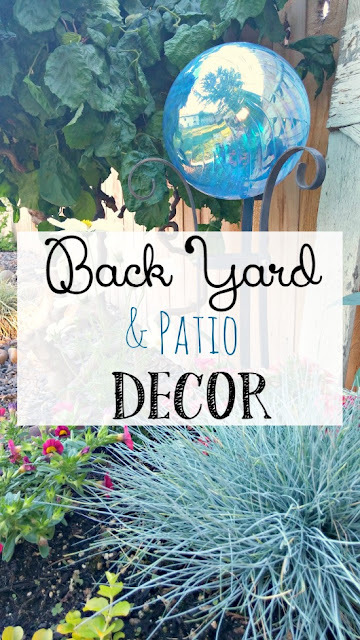 As soon as the weather started getting nice, I started sprucing up my backyard and patio and if you lived nearby I would have you over! 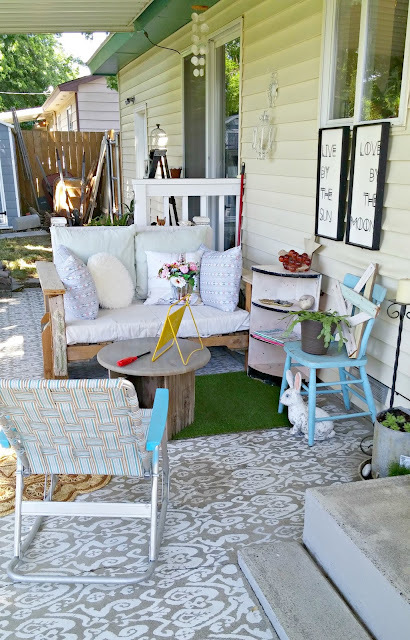 But since you don't live nearby, I can at least show you what it looks like! 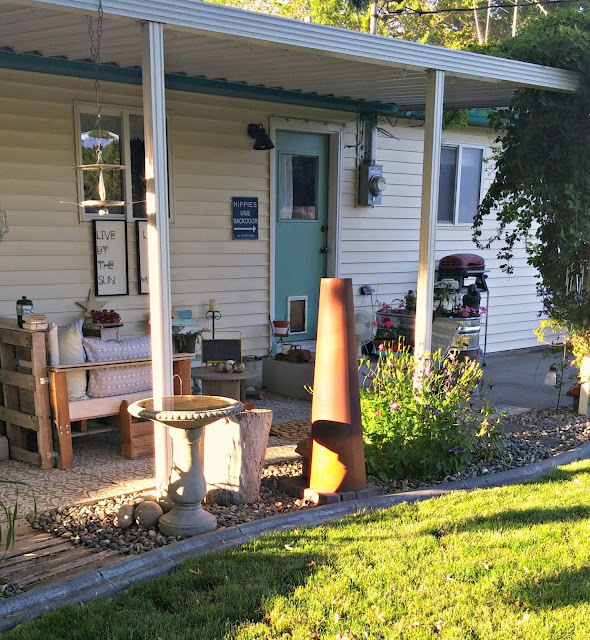 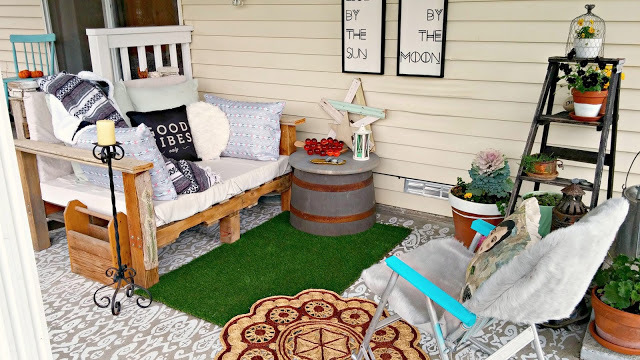 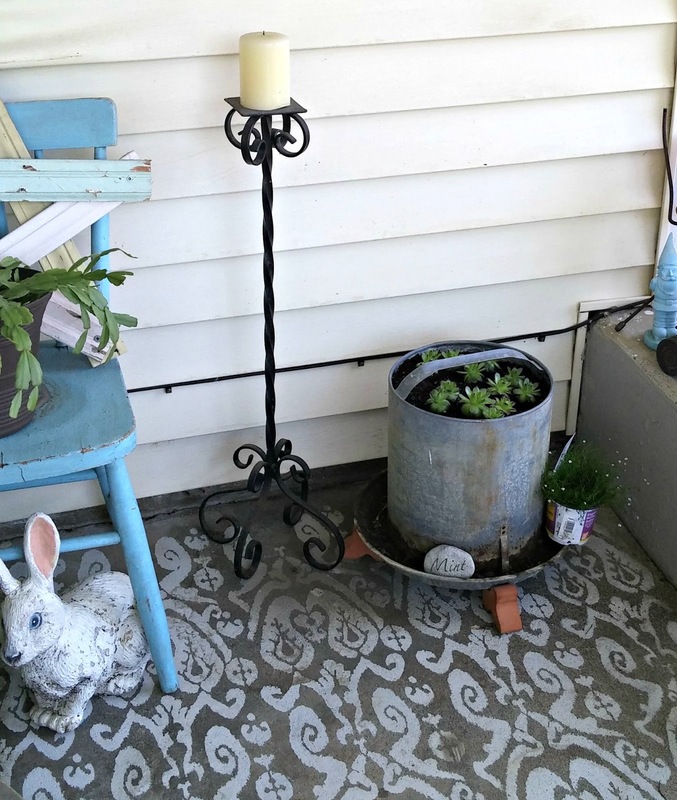 You may remember that last year I worked on fixing up the patio, you can see that post here: Boho Patio Reveal. I decided to reuse the whiskey barrel that you see as a side table in the first picture along with another one and create my Upcycled Horse Trough Raised Garden. 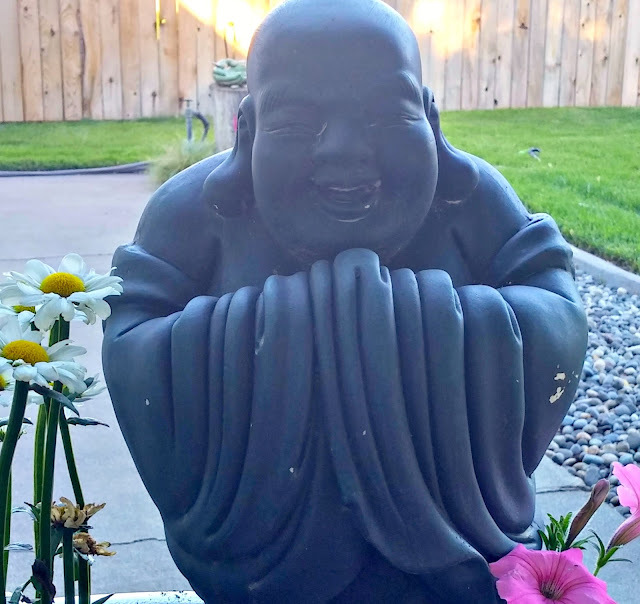 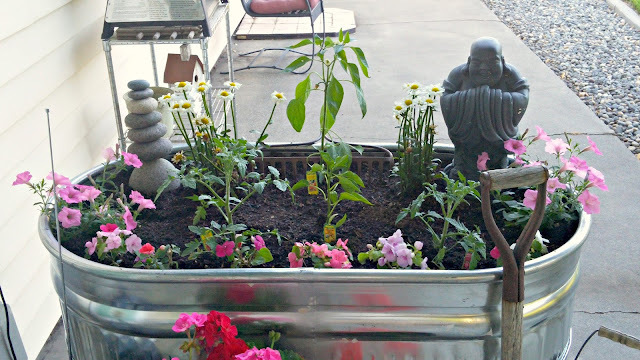 I put my little Buddha garden statue in it to watch over all the veggies and flowers. So far he's doing a great job because I have a little pepper growing on one of the pepper plants! 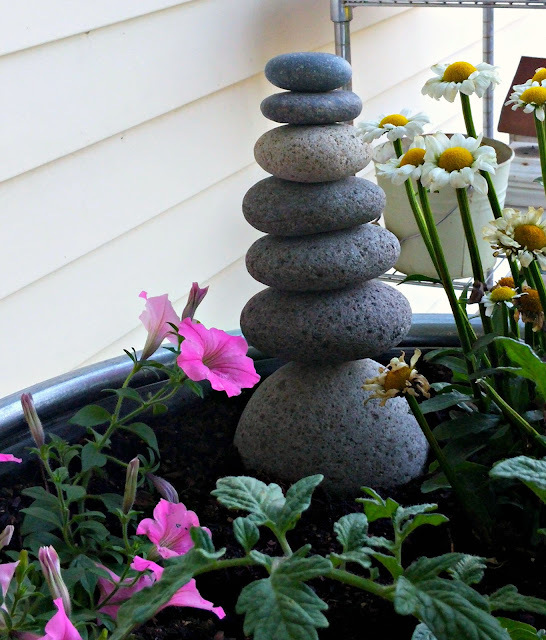 And I put this stack of rocks in the garden too... so it's kind of a little zen garden now! 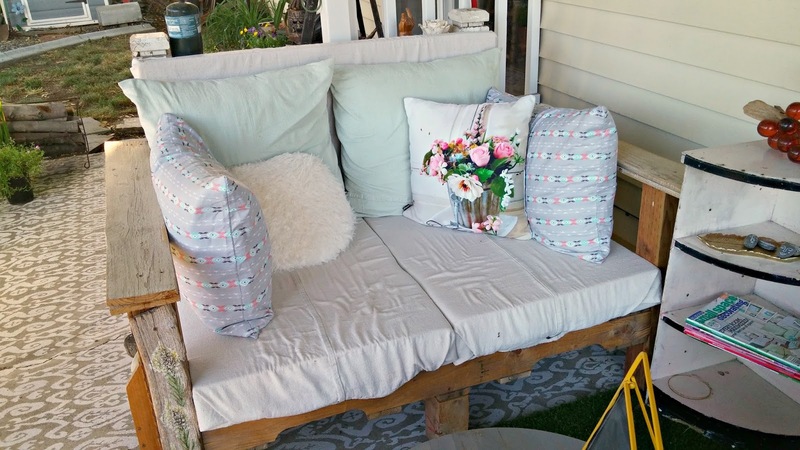 The pallet loveseat is all made up again with cushy pillows. This thing is SO comfy! I found this little blue chair at a yard sale for $3 last year. 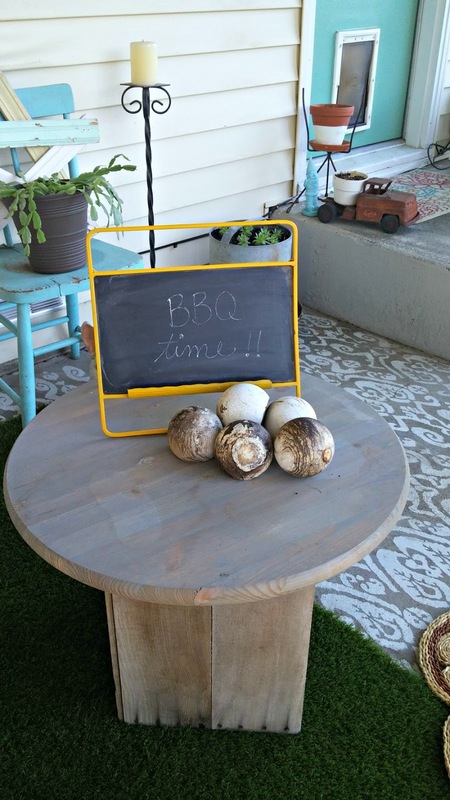 I reused the top that was on the whiskey barrel table and an old wooden crate I had to create a little coffee table. 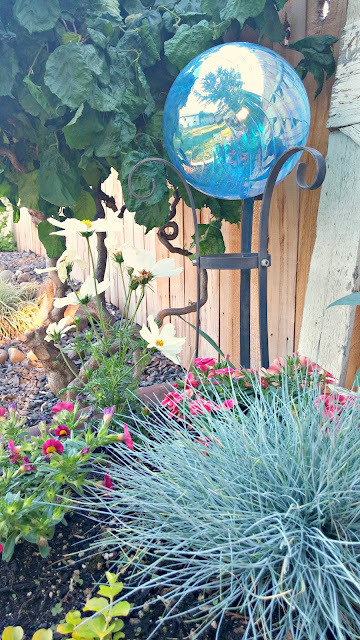 The balls on the table are fence tops that my mom saved from an old fence for me. I think they are kind of cute on the table! 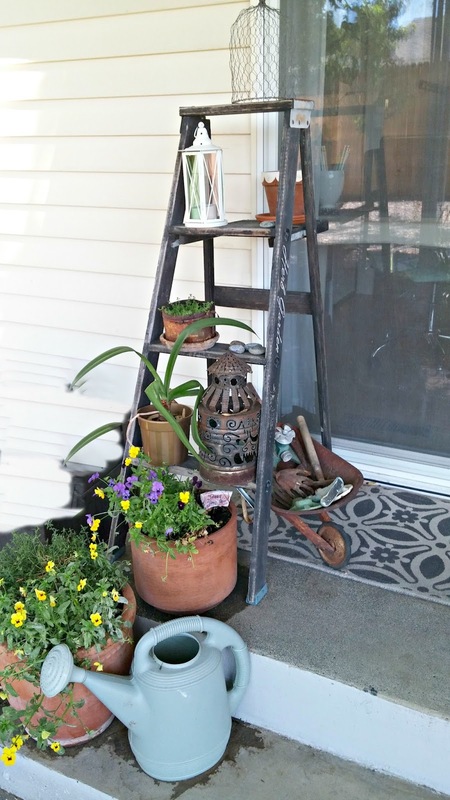 I moved the ladder over to the steps by the sliding glass door. 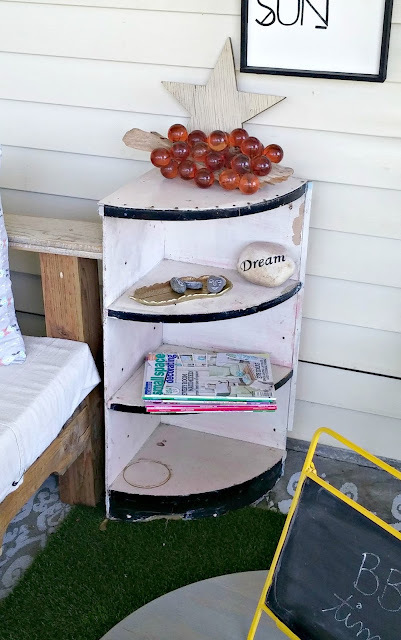 I had this little pink corner shelf in the garage, I got it for free at a garage sale. 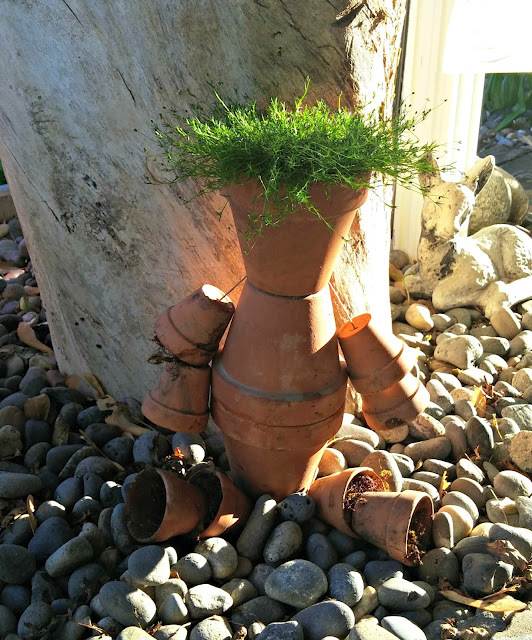 I rebuilt my little pot man, he had fallen apart but he's as good as new now! 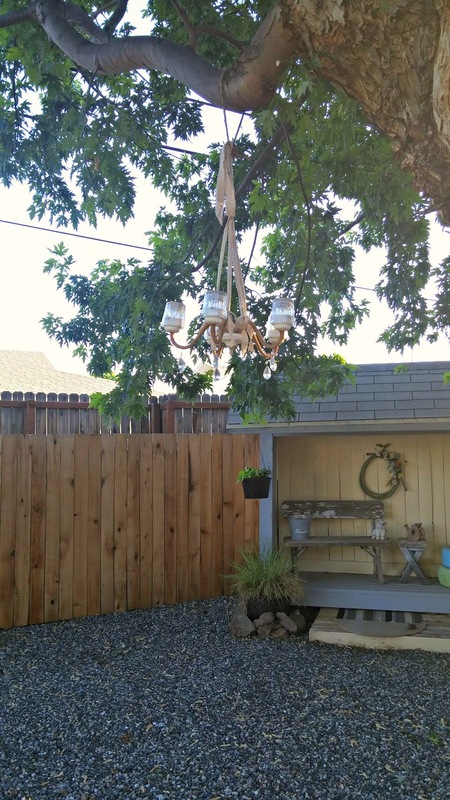 I hung a solar chandelier that I made about 4 years ago from a tree branch... can you see it? 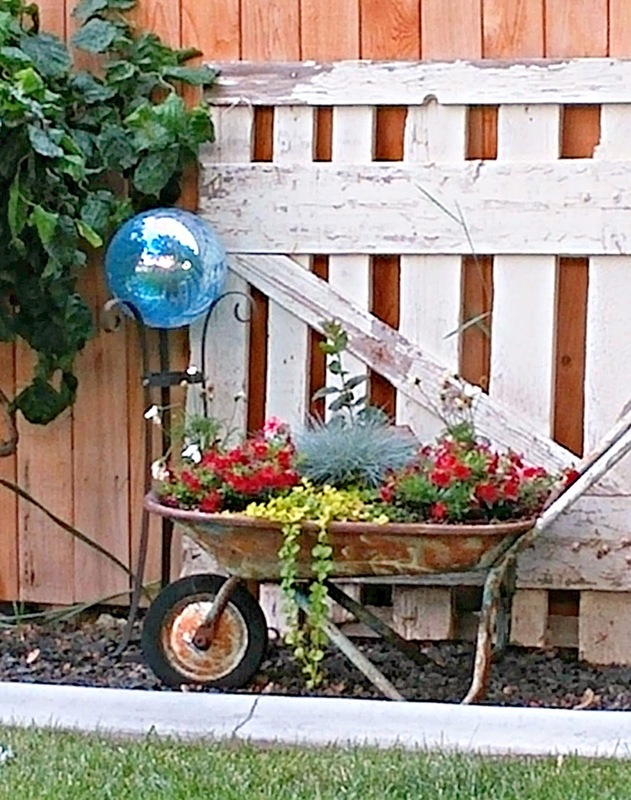 I replanted my grandma's old wheelbarrow. I love my pretty blue gazing ball. 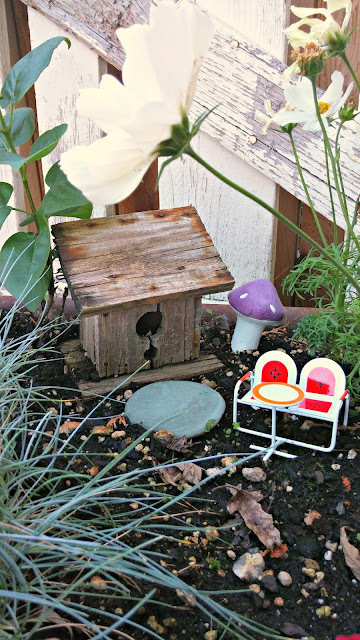 I found the little red and white fairy garden chair and table at Fred Meyer. I thought it would be cute next to the little birdhouse and mushroom in the wheelbarrow planter. I put together the Amazon shopping selections below so now you can shop my patio! 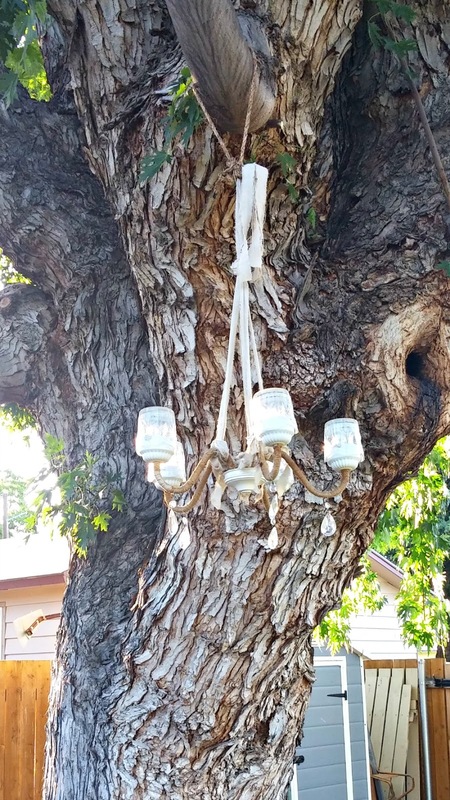 omg that chandelier on the tree is genius!!! WOWSERS you are making me want to get straight to the backyard and start decorating. SUPER picS! Thanks, I made it from a repurposed chandelier and some pretty glass solar lights... the kind that usually poke into the ground... just took the pokey part off. 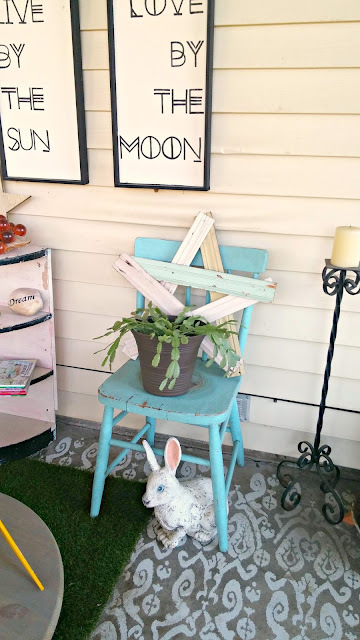 I had a tutorial post at one time but I lost it along with some other posts... 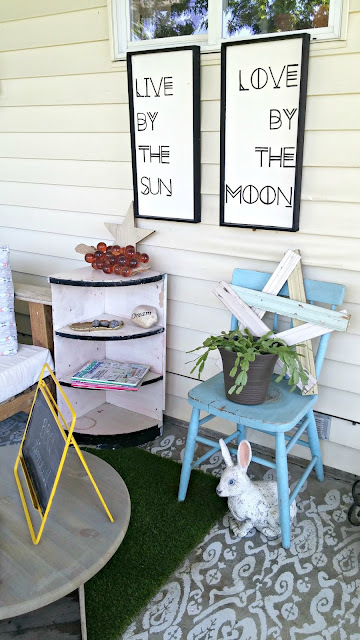 I should try and recreate that! 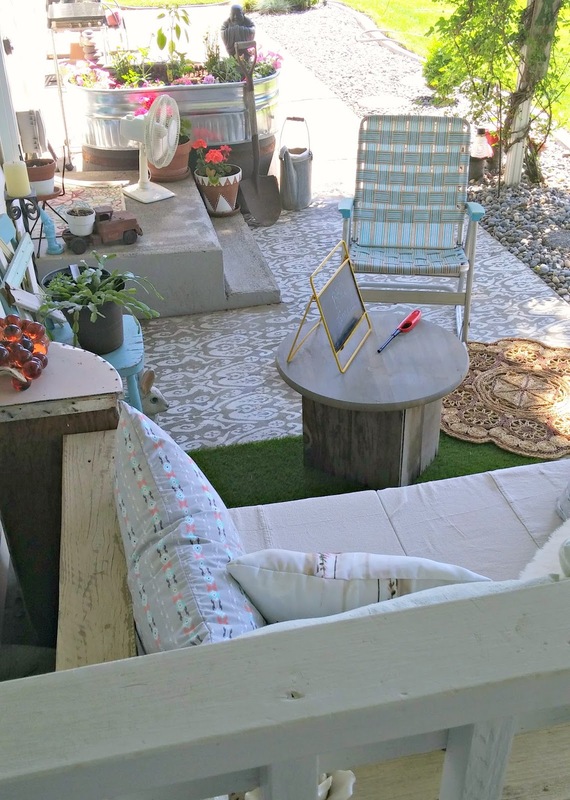 I want it to quit raining so I can work in my yard. 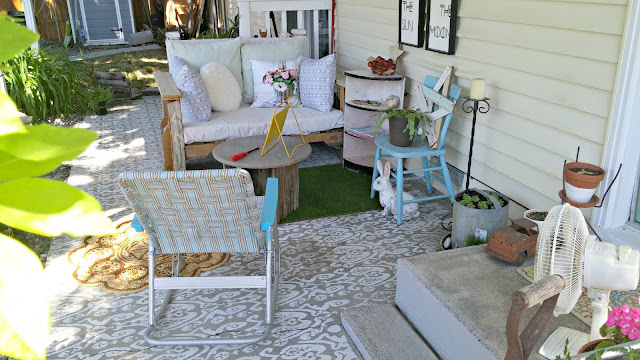 Yours looks so nice and the patio looks really cozy.